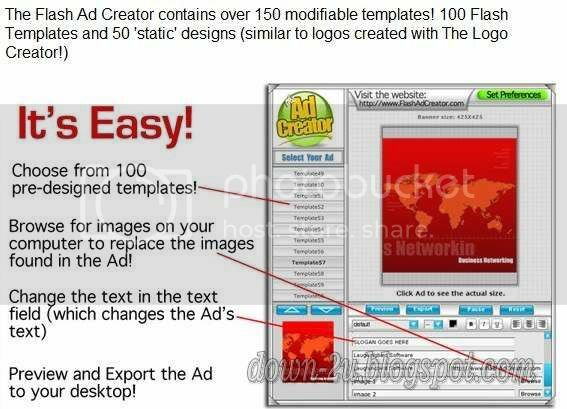 The Flash Ad Creator version 2.5 from Laughingbird Software gives you the ability to create terrific looking Ads ...Animated Flash ads and non-animated ad campaigns that look like a Flash and Photoshop guru spent hours laboring over!Create animated (.swf) banner ads in minutes! Export them as .swf files or use the 'stationery' ad creator to produce ads in a Jpeg format! 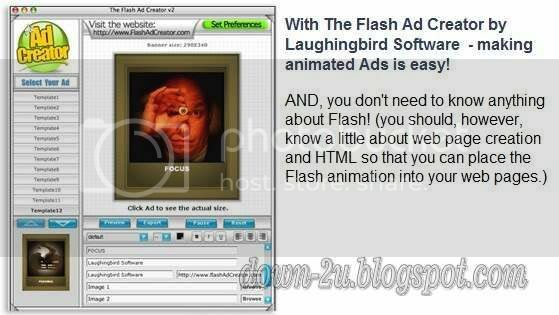 Ads that look like a Flash guru spent hours laboring over! This version of The Logo creator comes with 50 Ad Design templates to mix, match and personalize! (All new images never before seen in any version of The Logo Creator! It's TWO products in ONE! and 50 non-animated ad layouts to mix match and manipulate! 50 customizable non-animated layouts - thousands of combinations possible! Mix, match and personalize them all! (This section of the software uses the same 'engine' found in The Logo Creator software).